We just finished a job in Barton Creek that I’m really excited about. What I love most about my job is design. Well, I guess that’s one of the two things I like most. I love getting to meet my customers and know their families and understand and fulfill their goals. I know that what we build for them will really change the way they live. They will spend more time outdoors and will make countless memories outside their home. It will essentially increase the size of their home. When this customer purchased their home, they had a treated pine deck that was 7′ off the ground. The treated pine was all warped and the deck was very poorly supported by 4×4 posts. The joists were over-spanned causing a big sag in the deck. It was an eye-sore. At the beginning of a job, my customers always have an idea of what they would like to build. But what I like to do is back up and ask them how they want to live in their yard. Like many customers in Austin the most important design objective is relief from the sun. This family lived on two levels in their back yard. 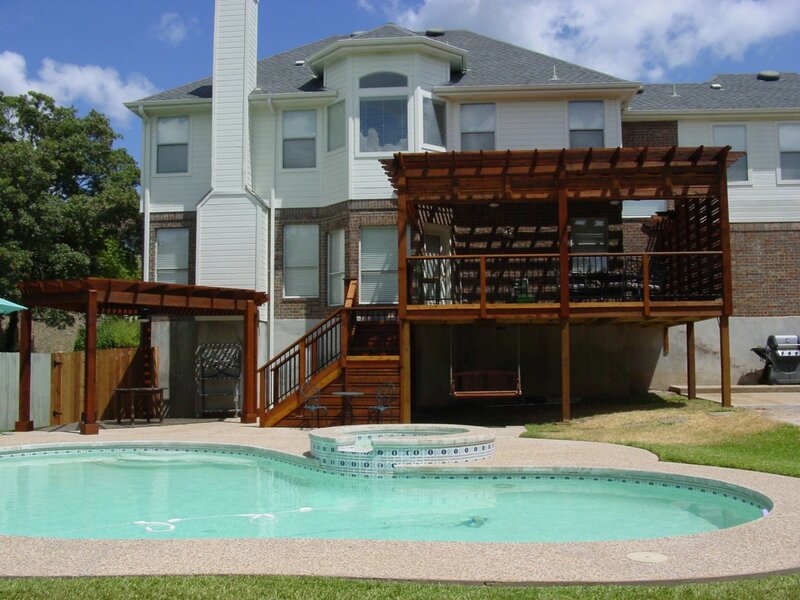 One level was the elevated deck and the second level was adjacent to the pool. Relief from the sun was needed on both levels. So the first thing we decided was to build 2 pergolas – one at each level. 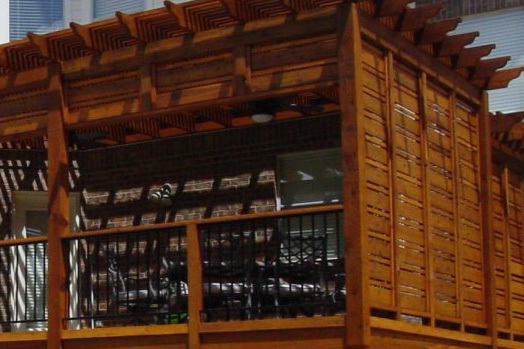 After building outdoor structures for 18 years, I’ve learned many things from my customers and through experience in building. One of the things that is so often overlooked is access. How do the customers access their structure and how they access other their yard from the structure. At this home, the deck access was on the far side of the house – away from the pool. 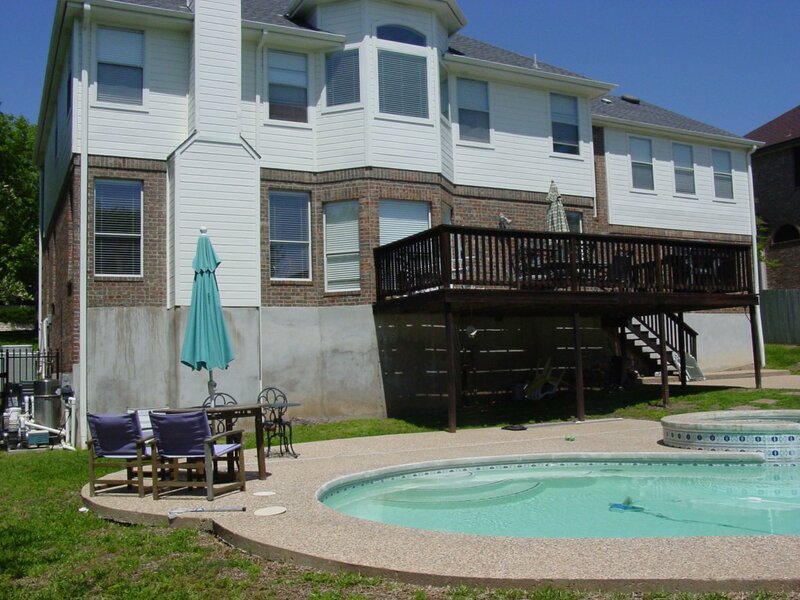 So, the first thing we discussed was moving the stairs to the far left side of the deck so the family could easily walk down the steps and right into the pool and lower level shade area. We also created a landing area on the stairs so we could make the stair area compact and not take away from the living area on the lower level. 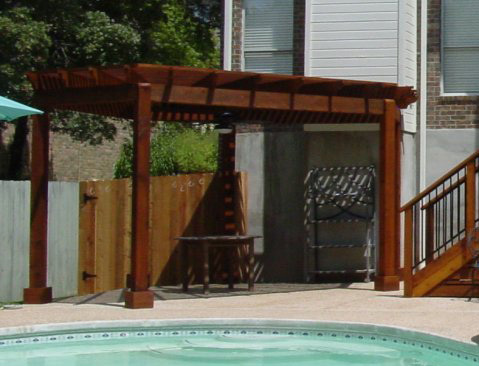 The customer wanted a hanging swing at the pool level which works nicely when a deck has head clearance. It looks great and it’s a nice shady spot to sit. On the lower living area, the customer had an existing pool with concrete patio. Unfortunately, since there was no shade relief at all, they weren’t able to spend as much time there as they liked. So we extended the concrete patio over to the corner of the yard and created an additional flared pergola. 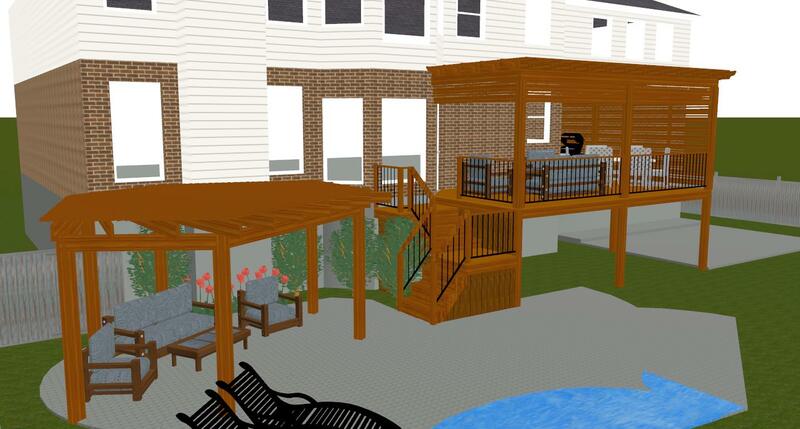 At the deck level, we had several objectives for the pergola. The homeowners wanted some privacy on the outer side but didn’t want to give up on the breeze from that direction. So we used a deco wall that allowed air flow to enjoy any breeze that comes from that direction. To add to the air flow and circulation, we added 2 ceiling fans. Finally, we wanted to create one last bit of sun relief on the upper deck. So we added an 18″ drop off the front of the pergola so they still had full visibility out into the yard, but relief from the setting sun. When the sun is at an angle, it still came into the living space. 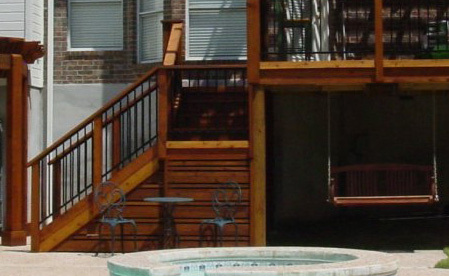 One small detail that makes a big difference is adding iron rails to a deck. You wouldn’t think that the width difference between iron rails and wood rails would make a big difference but it makes a huge difference in 2 ways. First, you have more visibility out into your yard. Secondly, you do not feel boxed into an area. Before, the plan, and after. This entry was posted on September 20, 2010 by austinporchandpatio. It was filed under Pergolas and was tagged with Austin pergola, Austin pergola with privacy wall.